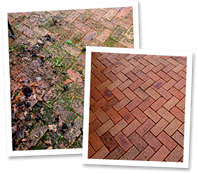 Using our high powered jet wash machine, and our industrial rotary surface cleaner, depending on the job required, we can clean almost any outdoor hard surface including block paving, tarmac and concrete driveways, brickwork, pathways, patios and decking. Our system provides a deep clean that is not obtainable with a domestic pressure washer. With our professional equipment we can expertly remove surface grime, weeds, moss and algae to leave the surface looking like new. For this purpose we can treat the surface with a sealer or algaecide/fungicide to help deter the return of algae and lichen, keeping the surface clean for longer periods.